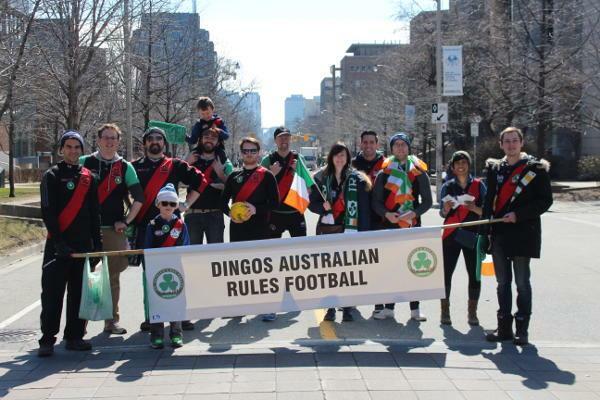 On Sunday March 19th the Toronto Dingo’s joined the Toronto St. Patrick’s Day Parade for their second inaugural appearance. The Dingo’s were well represented by a number of our Irish, Canadian, and Australian players as well as family and friends. 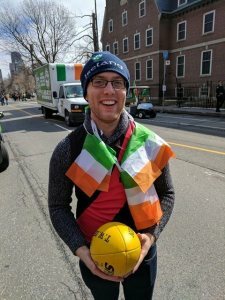 Those assembled enjoyed what turned out to be a perfect Irish summer’s day right here in Toronto, marching to celebrate Ireland’s history, culture and heritage and contributions to Canadian society as well as more recently our own AFL Ontario league. While travelling on Bloor, Yonge, and Queen Street those assembled also enjoyed plenty of opportunities to break out into a kick to kick while engaging the crowds lining the route. It’s not everyday you get to have a kick on Yonge Street! Finally after turning up University to finish the official parade route the assembled crew headed to The Office Pub to enjoy a bite and some well earned refreshments. For more photos of the day, check out our Facebook album. If you're interested in joining the pack for the 2017 season, please contact recruiting@torontodingos.ca.